This is another popular North American recipe that I always avoided because the whole idea of eating bread and sugar wasn’t very enticing. Still, I am always ready to try new things, even if it is for just one time [lol], which is exactly what happened in this case. Honestly, the bread was quite good and after swapping ingredients around, I managed to create a sort of cross-breed or mutt if you want, between your classic pull apart bread recipe and those delicious cinnamon buns. Result was impressing but not enough to bake it the second time; clearly I am not a fan but it goes pretty well with coffee. As far as I’m concerned, if you know your way around the oven, bake something else. There are tons of great desserts out there that just wait to be tested. 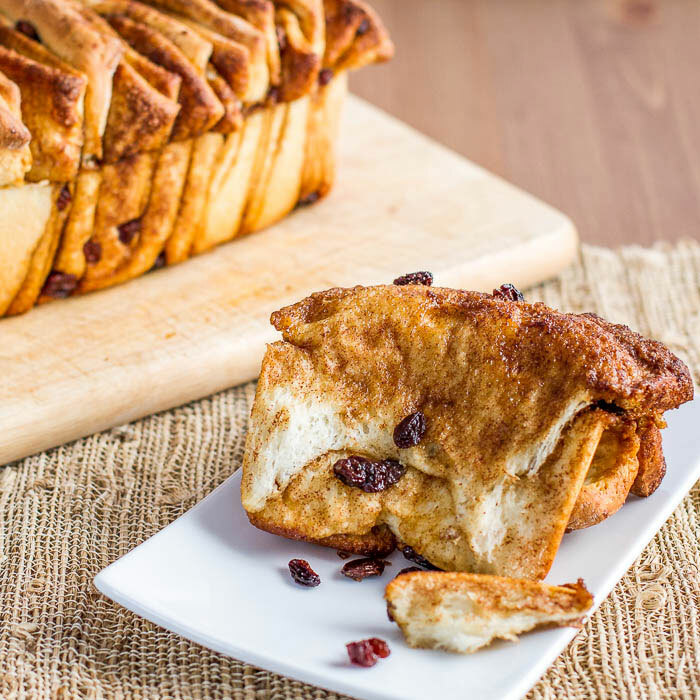 For now, I give you the Raisin and Cinnamon Pull Apart Bread, a perfect companion for your morning coffee (but don’t expect me to replace my bacon and eggs anytime soon). Enjoy! Now on with the recipe. If you want a big and fluffy bread, you have to be careful what yeast you use and how long you activate it. Activation is pretty easy, just pour the required quantity of yeast in a bit of water along with some sugar and let it sit for 10-15 minutes or until it becomes frothy. Mixing wet ingredients separate from the dry ones seems to increase your chances of success as well. When you decide both are well combined, pour wet and dry ingredients into the bowl of your mixer and give it a serious swirl until everything is well incorporated. Place dough in a plastic bowl and cover with a damp towel; let rise for as long as you can, usually one hour and up or until it looks like the one in my picture (humongous). Next steps are clearly shown in my pictures but you can find them in the recipe below as well. You should get something like this after 35 to 40 minutes of baking at 350° F / 175° C. Gorgeous, eh? I welcome questions. 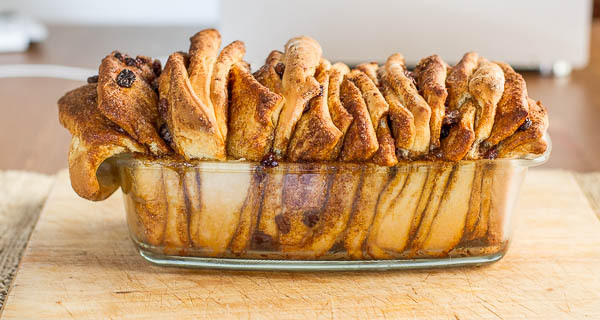 Raisin and Cinnamon Pull Apart Bread in another perspective. Make sure you let it cool off for about 20 minutes before removing from the pan. In a small bowl mix the yeast with the warm water. Let it sit until it bubbles. In the meantime, melt the butter in the microwave for about 45 seconds then add the milk to it and stir. Add eggs and vanilla and whisk. In the bowl of your mixer add all the dry ingredients, flour, sugar and salt. Pour in the wet ingredients, including the yeast mixture and mix for about 3 to 5 minutes, the dough will be a bit sticky. Place in an oiled bowl and cover with a damp cloth; let rise until it doubles in size. Roll the dough out into a rectangle that’s about 12 inches by 20 inches. Brush the dough with butter, then sprinkle with the brown sugar cinnamon mix and add raisins. 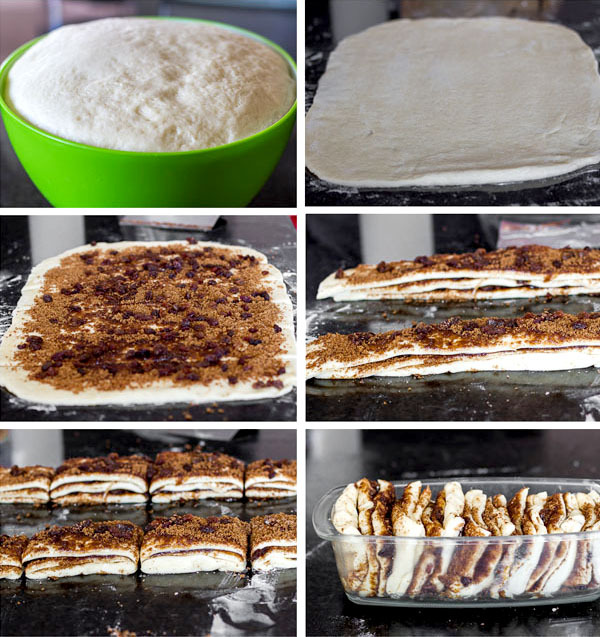 Cut the dough into 6 long strips vertically. Stack 3 strips on top of each other, so you end up with 2 stack of 3 strips each. Cut each stack into 4 little stacks. I ended up with 8 total little stacks. Layer the dough squares in the loaf pan like a flip-book. Cover the loaf pan with a damp kitchen towel and let rest for another 30 minutes until almost doubled in size. Preheat oven to 350° F / 175° C and bake the bread for about 35 to 40 minutes or until golden brown. Let the bread cool for about 20 minutes then carefully remove it from the pan.